UPDATE #4: Mike’s BBQ took over the space to much smoked meaty success. UPDATE #3: South Philly Barbacoa is closing and moving to the Italian Market as a sister restaurant of El Compadre as of 6/25/2017. UPDATE #2: Vegan Commissary closed and it is now South Philly Barbacoa as of 7/5/2015. UPDATE: Adriana’s closed and is now the Vegan Commissary. The new Adriana’s Restaurant & Pizzeria at 1703 South 11th Street opened a couple of weeks ago with little fanfare. Formerly on 2nd Street in Pennsport, this well-known, award winning shop (three-time gold medal winner at the South Philly Review’s annual Pizza Olympics), sits in a very unassuming spot — 1 door in from the corner — home of the former “Friends & Family Cafe”. 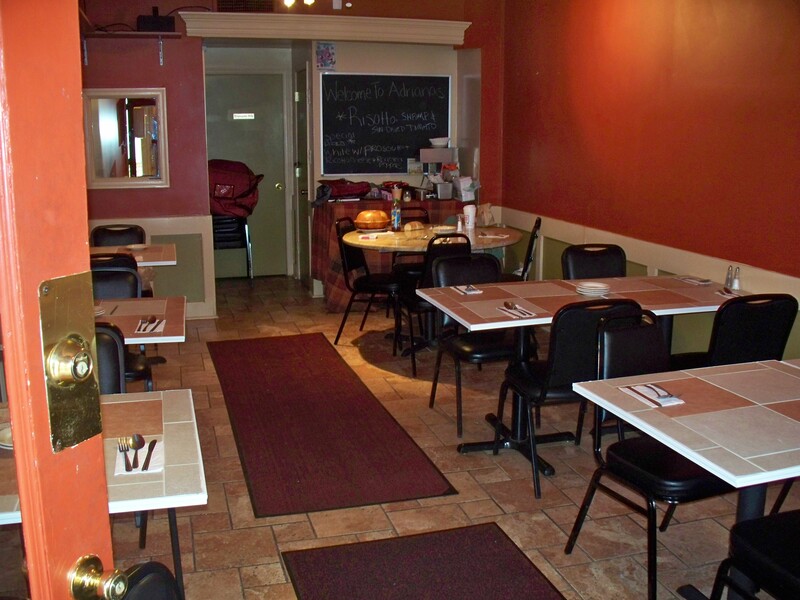 When you step inside, you’re smack dab in a tiny dining room. Its a basic, cozy space. There’s no counter, so if you’re taking out, you simply tell the server your order and wait for it. Which is what I did. There is a Risotto special and Pizza special every day. I was also informed by the courteous server that starting today, all day, and every Monday and Wednesday is All You Can Eat Mussels for $11.95. I’m not a fan of mussels, but for those of you who are — sounds like a sweet deal! 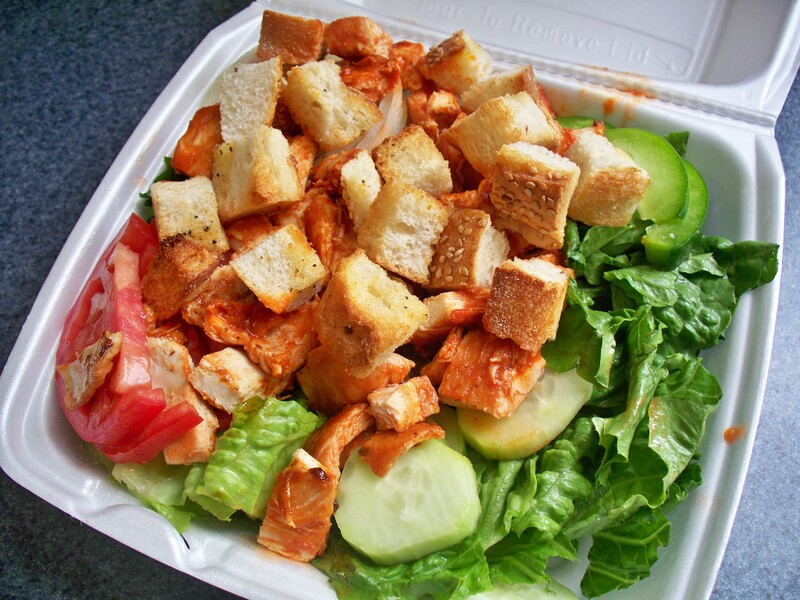 Since pizza is a no-no for me, I opted for a Grilled Buffalo Chicken Salad with honey mustard dressing. It was sufficient and tasty. In addition to their award-winning pizza and yummy salads, they’ve got stromboli, calzones, steak sandwiches, burgers, hot sandwiches, chicken cutlet & eggplant sandwiches, wings, pasta, chicken, veal & eggplant, and seafood dishes too. 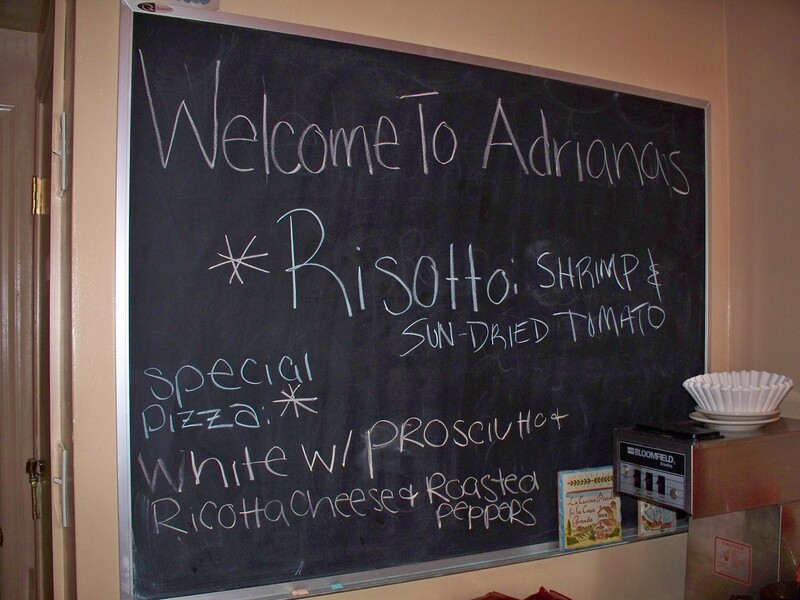 Next time you’re in the area, try Adriana’s Restaurant & Pizzeria on for size for dine-in or take-out. They also deliver. 267-909-8525 or 267-909-8527. UPDATE: Adriana’s is closed. It is now the Vegan Commissary. I tried their mussels my first visit there and have gone back for more again..again…and yet again! I just can’t get enough of that white sauce! Their pasta dishes take me back to Sunday dinners as a child. I love everything about Adriana’s Resturant and Pizzeria and highly recommend it.